We come to an ebook for English Vocab builder, in this ebook you can memorise 750+ English vocab words with tricks. This will help you in upcoming CAT, SSC CGL/ CPO and Bank exams. 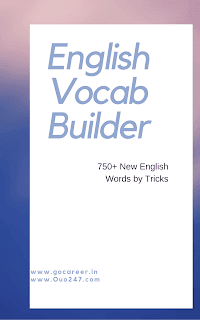 You can download this English vocab ebook for just 69 Rs. Once you paid to we will send you class notes on same email id which you will mention during payment time. We will provide you with all notes within 24 hours. If you have any doubts, you can message us at Facebook page.